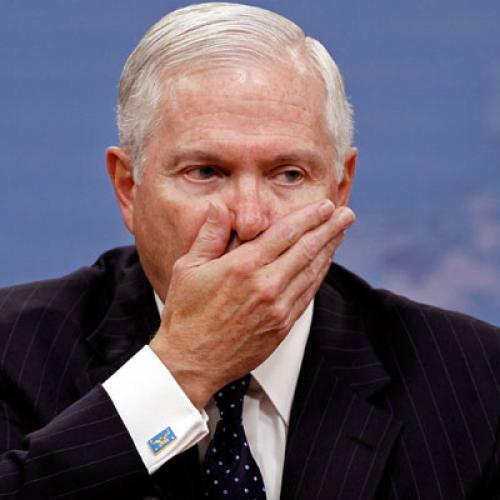 The defense ministers of our NATO allies met last week in Slovakia--a place where NATO power has much recent neighborly resonance--and among the gathering was also Robert Gates. His position on Afghanistan is not quite clear, poised as he is between his president and his men. Of course, Obama has more power. And his men are not really his in the sense that his career, even while in the military, was with intelligence operations and not the military. Now, having already chastised General Stanley McChrystal for embarrassing him and his boss, Gates did not especially need his civilian colleagues, to a person, in the Western defense apparatus to join together and press for "more" rather than "less" in Afghanistan. It is something that wouldn't have occurred had George Bush still been president, whatever position he actually held on additional men, women and materiel to the AfPak battle theatre. In any case, what is clear is that the alliance does not want to be dragged into a military commitment. Afghanistan is its military commitment, and strongly so. It has acted to influence Obama in actually fulfilling his commitment made to American voters last year and it is trying to prevent him from backtracking or sidetracking. This is, moreover, not just a rhetorical move: it comes with the promise of personnel, the most precious promise of all. I don't want to overstate the meaning of this development. But it represents the coming of age or to respectability of the eastern and central European members of NATO which have been under a measure of surveillance from their seniors. They are not less strong or less committed to the idea and reality of the West than Portugal or to the palpable of themselves than is poor Belgium, never really a nation and now burdened by immigrant Muslims who haven't the foggiest of what the concept even means. Secondly, it shows the resilience of NATO (rather than EUROPE in capital letters) as a practical matter, even if it is the matter of fighting. Thirdly, it marks the end of the Suez crisis in Europe, which has in a way been lumbering along for more than half a century. The fact is that President Eisenhower and his secretary of state John Foster Dulles betrayed--yes, betrayed!--Great Britain and France in forcing them (and Israel, too, but most significantly, London and Paris) out of their last imperial act: which was to rescue Suez from Gamal Abdel Nasser and Egypt from the degraded path as a dependent collaborator of the Soviet Union. Please read Elie Kedourie, "Suez Revisited," in Islam and the Modern World, published by TNR Books. The shadow of Suez has now been lifted, a shadow that interceded against the solidarity of the Western alliance any time the U.S. invoked it, and not just in Vietnam. Let me not exaggerate the tonic capacities of NATO. But, with this initiative taken by the allies against what they certainly knew was Obama's hesitations to lead in AfPak (and the dire consequences of that more generalized instinct in his administration) we face the prospects of a more independent but not necessarily less forward Europe. I am not sure that this is what the "yes, we can" crowd really had in mind. But, then, it is mostly the Democrats who are trying to pull Obama out from Afghanistan. How ironic it is that our allies want us in...and even to lead them, althoug---as you can tell--I doubt that America want to lead anyone anywhere. Except, of course, Israel. But this is a continuation of the Suez mindset. Although no one has any doubts about any Arabs any more, save George Mitchell and his bosses. As for Afghanistan, I want to call your attention to what I (proudly) consider the best two writings on the choices we now face in that country. One is by Peter Bergen, "The Front," in our last issue and reprinted in this space, the other by Stephen Biddle, "Is There a Middle Way?" also in our last issue and also reprinted in this space.